Last week a small group of old and new friends gathered on Mendenhall to cook Chinese with the instruction of my friends Wendy and Jacob. Wendy is a transplant from Hong Kong who found herself in Greensboro after studying at Guilford College and Jacob, grew up in the nearby metropolis of Reidesville, but spent two years in China after college. Soon after meeting Jacob he recommended that Mod Meals had a post highlighting his favorite Asian cuisine. 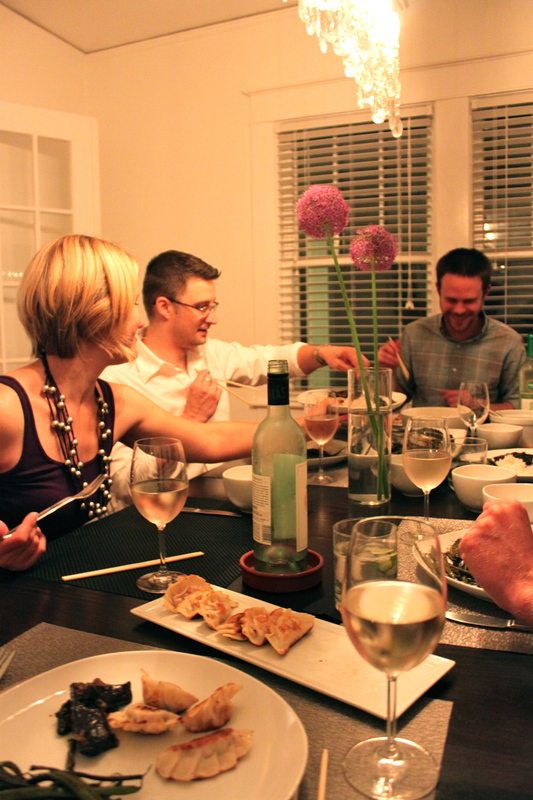 And quickly after conversing about the idea of a Chinese cooking class, I jumped at the chance to have everyone over. We spent the evening drinking ginger gin & tonics, making extra trips for forgotten ingredients, competing over the best dumpling form, testing bites of piping hot dumplings with communal utensils and reminiscing over cross cultural perspectives. Wendy gave a incredibly fun lesson on Chinese Dumplings, Jacob recreated his favorite Spicy Sichuan Eggplant and I cheated making a Southern woman’s (Sara Foster) recipe for Hoisin Green Beans. The meal was more authentic than most on Mendenhall and exceptionally fun and delicious. We stuffed our faces around a crowded dining room table until very late in the evening. I’ll share the recipes from our Chinese Cooking night this week. Looks like the new dishes got a nice breaking in! I assume you used the rice bowls.